I am calling this a "Flannel Friday" because you COULD make the mittens and the special effect from flannel/felt. But you could also use foam. And I just used construction paper. There are several book versions of "The Mitten", including the pretty-pretty Jan Brett version and the lovely old fashioned version by Alvin Tresselt. But my favorite is Heather Forrest's wonderful musical version --you can hear it for free if you click on the link and look on the left at her "Story Listening Corner". At first, I just told it with puppets and didn't bother with a prop. But in recent years, I decided to fancy it up by adding a series of mittens on the magnet board as I told the story w/the puppets. I made them simply by printing out a mitten shape on yellow construction paper, first on my computer and then on our copy machine, each time making it a little bigger. Magnet tape holds them on my board. The view from the back. Just Mouse "in" the mitten. All puppets but 1 in the mitten. At the end of the story, I pulled them out and let them fall on the floor--or more accurately--tossed them in all directions, which of course, the kids LOVED. Then I came up with the piece de resistance--an extra special effect when the mitten explodes! All it took was some shredded yellow paper. 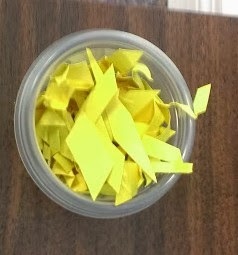 I used scrap paper, but you could put a sheet of yellow paper in a shredder, or even buy shredded gift paper in a party store. I put the paper in a small cup, tucked inside the big tote bag and clipped the bag to the back of my board.At the end of the story, I threw first the animals and then the paper. It was chaos of course, but then "I thrive on chaos" is my motto! And the kids all helped me pick up the paper and had fun. I started my program with this book. 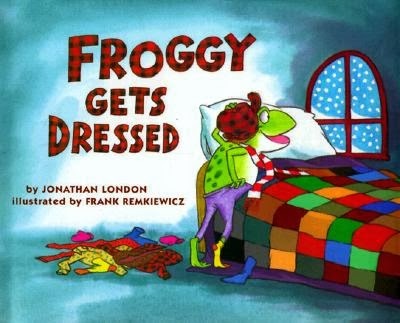 I CANNOT go through a winter without reading "Froggy". I have a big book version and I tell it in a BIG voice! The kids have been loving the "Sleeping Bunny" ukulele song/game that I learned from Miss Mary Liberry, so this week I turned it into a "Sleeping Froggies" game to play after this book. I really owe you big time for that song, Miss Mary! I don't do crafts with my 2 and up morning programs, but this week I put paper and crayons on my tables and asked parents to draw around their hands to make a mitten and then let the kids color it. I never cease to be amazed how daft parents and nannies can be. Even after I drew an "example" , something I never do for craft programs, there were lots of 5 finger gloves, and lots of families where they simple drew around the child's hand--no art! Still there were some very cute ones and I put them all up on the bulletin board near the story room door. Take Home Bags, Week 2: People seemed to like the take home bags, though I got limited feedback on if they did anything with them at home! I couldn't find a really child safe idea for the 2 and up set, so I simply put a mitten coloring sheet in the bag, and on the "More Fun" enclosure I've been making suggested once again doing the "draw a mitten" thing, with suggestions on ways to decorate it. We did a "draw, cut and decorate a mitten" craft at the afternoon program for the 3 and up crowd, so I needed to put something different in their bags. And what they got was a "snowball" made from flour/salt play clay, and the recipe for how to make more dough at home in the "More Fun" enclosure.The dough was easy to make at home--took me about 5 minutes to make a double batch, and I divided it into tiny balls with a mini-cookie scoop that I use at home to make meatballs. Each bag went into a zip-lock bag with this label. I found the play dough recipe on a website that has what it calls the "A to Z of Play Dough". Lots more great recipes there. It was quite a week. And now to figure out what I'm going to do to top this NEXT week! Thank you to Kathryn at Fun With Friends At Storytime for hosting this week's Flannel Friday. And everything you ever wanted to know about Flannel Friday is available at the Flannel Friday blog. Love this version! Thanks so much for sharing the link :) Would you have a printed copy of the words? I may use flannel figures when I tell it as I am not too comfortable with puppets! Love your blog. Lois, I tell my version based on Heather's and I don't think she has a book version. The Alvin Tresselt version of "The Mitten" is pretty close though. Interestingly, one of my moms commented this year that she really prefers this version rather than Jan Brett, because in the Brett version, the animals all bully their way into the mitten! Here the animals do it to be kind. The Tresselt version also has more of the flavor of the Russian/Ukrainian original. Enjoy!